Who says Gov. Palin doesn’t bring people together? Here you have a Catholic’s blog promoting a Jewish Shabbaton being held in conjunction with an event featuring an evangelical Protestant. 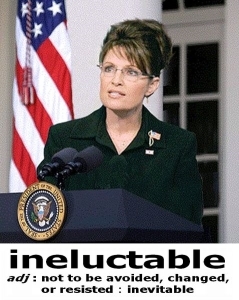 Poll Insider has written a noteworthy series of articles about Governor Sarah Palin’s electability. The first three articles of the series can be found here. First, who can be The $750 Million Candidate? Any chance to beat Obama rests heavily on the ability to raise money. John McCain was out-raised and outspent an incredible 2-1 by Barack Obama in 2008. While Obama was running $1 million dollar, prime-time campaign ads on network television just days before the election, McCain was boxed into a corner, penniless, watching from the sidelines. And the ability to raise funds is heavily dependent on the ability to get the conservative base on your side. McCain did not have that and saw his first real infusion of conservative cash only after he selected Palin as his VP nominee. If the Republican candidate is not conservative, conservatives will not give, and at least certainly not in the numbers they would to a conservative candidate. Just as liberals are the most politically active segment of the Democratic Party, so too are conservatives in the GOP. Moderates and “independents” are typically less involved, are last minute deciders, and often apathetic until voting time. Attempting to ride this as your political base is a mistake often made by “smart” establishment elites. They simply do not give money. And again, the Republican candidate will need a lot of it. Sarah Palin is clearly the best fundraiser. For two years she has been the hottest ticket at multiple fundraisers across the country on any given subject. I think there is little question that her supporters would be quick to give. Mike Huckabee proved woefully poor at raising cash in 2008, and much of his support comes from a much more politically inactive conservative base. Mitt Romney raised over $100 million in his primary loss in 2008, which is good, but would have a major problem getting donor cash from the Tea Party base. Again, the GOP candidate needs to have the ability to raise $750 Million. And even then they will still be at a disadvantage. And unless someone like a Donald Trump is willing to self-finance, who else could compete? Second, who can Pack a Stadium? The establishment Republicans say we need a boring thud (like Mitch Daniels/Tim Pawlenty!) to counter Obama’s base enthusiasm. Wait, they want a candidate that no one can get excited about? Being able to bring a crowd to see you is paramount. With Obama in 2008, it became an event to see him. Friends brought friends and their friends brought more friends. If you can’t get someone excited about seeing you, how can you get them excited about voting for you? Sarah Palin has proven, time and again, that she is the biggest draw in the GOP field. In 2008, it became so embarrassing for McCain that he had to begin holding rallies at the same location as Palin because he was barely filling classrooms and she was having venues changed to accommodate bigger crowds. Enthusiasm goes a long way, and is there any other candidate that could pack the house in a way that Palin could? Arguably, Palin is the Godmother of GOP crowds and, in my opinion, the Tea Party. Until Sarah Palin, the GOP did not gather. They did not show up in large numbers. They did not fill venues. They did not protest. Sarah Palin in 2008 almost single-handedly proved that conservatives could, like their Democrat counterparts, show up in large numbers in support of a candidate (or in opposition to one). For the first time, the silent majority was loud. (And 2009 and 2010 continued that trend first in opposition to Obamacare, then in support of tea Party candidates). Who else can do that? Finally, who is Most Compelling? The GOP nominee has to be compelling in every way. In debate, are they straightforward and honest? In speeches, are they able to get a point across without putting me to sleep? In campaign commercials, are they able to provide an inspiring vision for America? These are questions that will all be answered in the coming months. All three of these qualities/abilities are heavily dependent on the conservatism of the candidate. Remember, conservatives are the ones who either donate or do not. They are the ones who attend rallies. (When was the last great moderate rally?) The American people are overwhelmingly conservative, and the GOP base is reliant on the conservative vote. But you need more than conservatism to win. And only one candidate has it all. Sarah Palin appeared on FOX News’ Judge Jeanine on Saturday to discuss everything from the budget cuts to Paul Ryan’s Road Map to energy and more. But it seems as though her comment regarding Donald Trump is receiving the most media attention. Although Obama states he was born in Hawaii and that his birth certificate is on file at the state’s Department of Health, Trump insists that questions over Obama’s birthplace have not been settled and the president has spent “millions of dollars” in legal fees to try to get away from this issue. The president has released a “certificate of live birth,” a shorter document that carries the same legal weight as a birth certificate in Hawaii, but the president has not released his so-called “longform” birth certificate, and this has been the source of speculation. 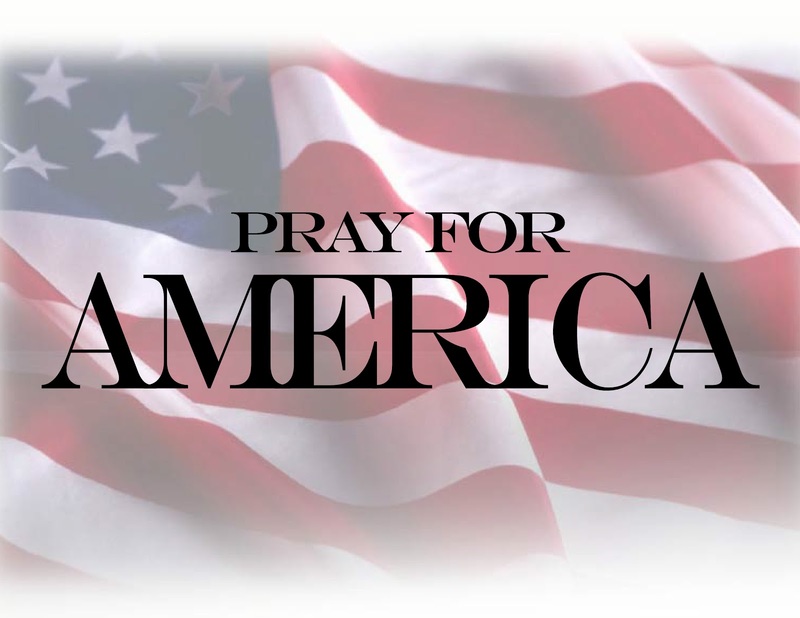 With rumors swirling of a potential 2012 presidential bid by Trump, the issue has once again come front and center. Judge Jeanine asked Palin what she thought of the issue. As much as the media want to portray Palin as flip-flopping on the issue, the former governor has continually supported the right of voters to seek information if they so choose. Congressional leaders agreed late Friday to a compromise that will keep the federal government funded for the remainder of the fiscal year and averted a government shutdown. Many are now analyzing the 11th-hour spending deal, and looking ahead as Congress irons out the details of the long-term plan. Sarah Palin appeared on Fox News’ Justice with Judge Jeanine on Saturday night and was asked if she thought the Tea Party was happy about the budget compromise. Things will certainly get interesting next week as the debate begins over raising the debt ceiling, the amount of money Congress allows the U.S. government to borrow. The current debt ceiling is about $14.3 trillion, a figure that should be reached within the next five weeks, according to Treasury Secretary Tim Geithner. To avoid possible default, Congress must decide on whether they should increase the debt ceiling by $1 trillion. 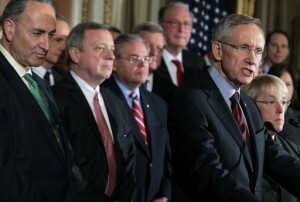 Republican lawmakers say they will not vote for it unless the Democrats agree to significant spending cuts. I really liked Karl Rove’s analogy he gave Monday afternoon on Fox News. Rove compared it to a family’s credit card. When a family exceeds their credit limit, you don’t go out and get another card. You cut that credit card up and work on your debt. That’s exactly what Congress needs to do. Instead of increasing the debt ceiling and heading further into debt, why don’t they focus on spending cuts? Many are worried that if you don’t raise the debt ceiling, the U.S. will default on its loans and the economy will collapse. However, on Justice with Judge Jeanine, Palin stated that she doesn’t think the economy will collapse since the government takes in about 6 billion dollars a day. Leftists suffer from a derangement syndrome even more acute than the one attached to George Bush when they talk about, read about, write about or even think about Sarah Palin. The second she appears in public, they are programmed like Terminators to lock on and destroy by any means necessary. Nothing is off limits, not even her physically disabled toddler. It’s sad, but it’s a great opportunity to expose the mentally unstable Left to regular folks. They are never more unattractive than when they are excoriating the Palins. A show hosted by Palin would offer ample opportunities to tweak the Left. After the news or issues of the day, Palin could feature the “Caribou Barbie Corner” where she could demonstrate how to field-dress a moose or how to butcher a caribou and offer helpful freezing tips. That could segue into a cooking segment where a guest could help her prepare the day’s kill. Todd can get in on the action too in “Todd Time” where he can offer stay-at-home-dads advice and guidance as well as snow machine racing footage. This would drive the Left insane. The best part would be watching the anti-woman feminists come out of the woodwork to try to strip her of her “womanhood,” further demonstrating the faux feminist agenda has nothing whatsoever to do with women, but with the cause of the Left alone. Did I mention the Facebook group entitled “Sarah Palin Must Die?” It has since been removed, but it had over 1,000 members. She is definitely the right person to make the Left jump right off that cliff of civility. 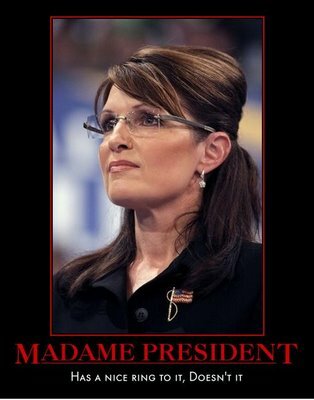 While the prospect of Sarahcuda making the moonbats bark every weekday afternoon with her own TV program is indeed tantalizing, Palin supporters are hoping that the 2008 GOP vice presidential candidate has other plans and higher ambitions. Andrew Breitbart is some kind of mad genius who has taken the Internet by storm with Big Journalism, Big Hollywood, Big Peace, and Big Government. “Big TV” is the next logical step. Breitbart’s effect on “progressives” is to drive them into fits of rage almost as intense and insane as the seizures into which our Sarah sends them. “Big TV” would be must-see TV for red-blooded conservatives.